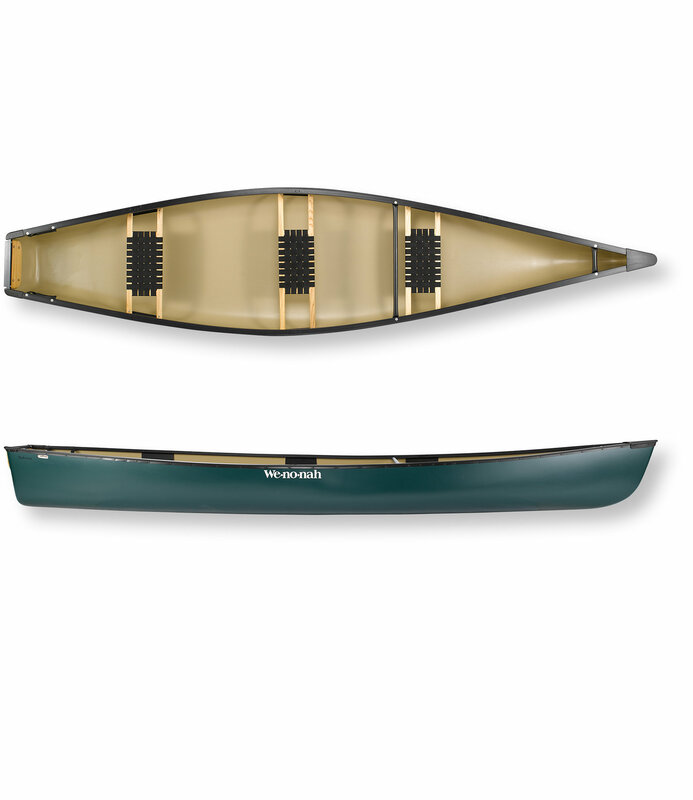 This is a great all-around recreational solo canoe. 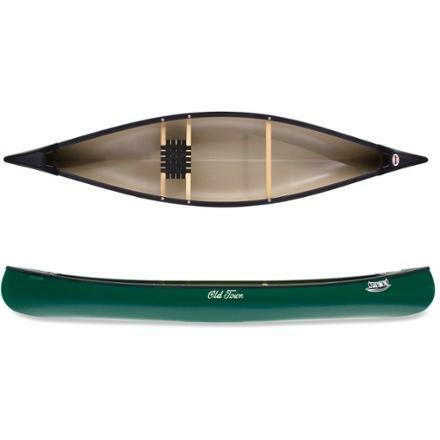 This is a great all-around recreational solo canoe. It maneuvers on a dime, weighs just over 30 lbs, and can take a beating. If you can still find one I would recommend picking it up. Since they stopped making Royalex and other options in the Old Town line are about 20 lbs heavier. I picked up an Old Town Pack on a scratch and dent deal at my local outfitter for just over $350 about five years ago. 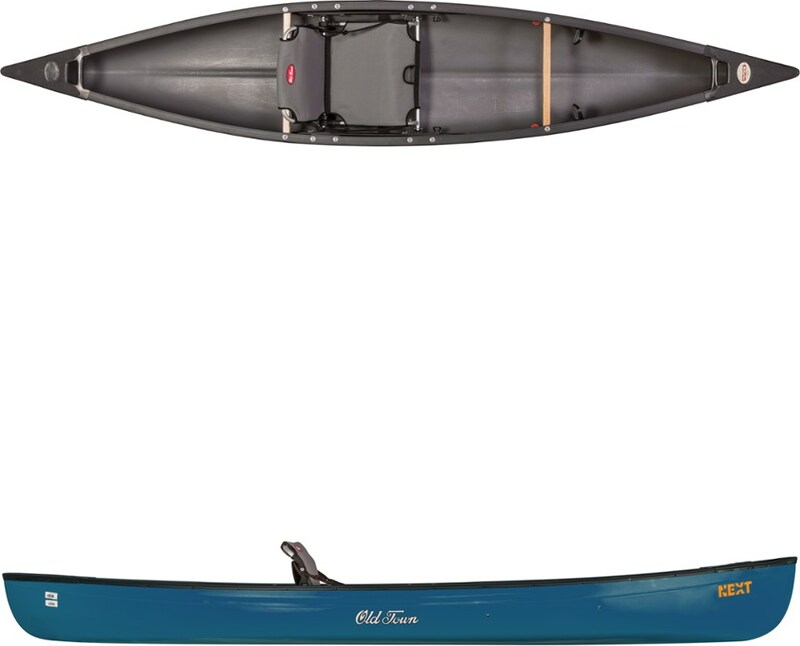 I had been planning on adding this to my fleet due to an aging back and wanting a really light option for quick trips to the local lakes and river. When I heard that they were going to stop making Royalex, the durable composite of vinyl and plastic that allows these crafts to be so light, I started searching for a deal. If you find one online or in a store used, I would strongly recommend picking it up. They won't make them this light again until some new technology comes along. The other Old Town solo options weigh around 50-60 lbs. For this aging guy, that is too heavy for a solo canoe! The Old Town Pack is about the lightest and easiest handling solo canoe that I have found. The Royalex hull scratches easily, but is almost bulletproof (the scars make it look better to me!). It can turn on a dime, but takes an experienced paddler to keep it on course as it is so short it doesn't track well. There are many complaints on the net about stability, but I found it to have decent primary and good secondary stability. I am completely comfortable running easy fishing rivers (Class I and II mostly) and lakes even on windy days. The ease of getting this boat on the car and to the water has increased the number of trips I take and maximized my enjoyment of this little gem of the canoe world. I own two others, and have had several more, and unless I am taking a second person, this is the go-to canoe for me. The Pack is only 12 ft long, and therefore has big pros and cons due to this size. 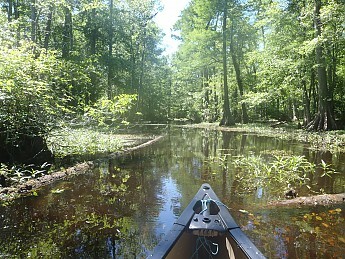 It can turn in the tightest of streams and work its way around trees through swamps that many other canoes would have trouble maneuvering into. 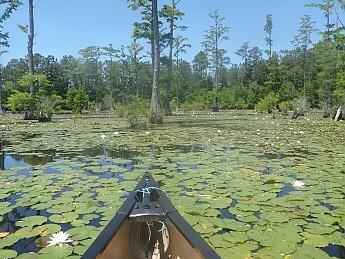 In the photo above, I paddled off the main channel you can see into the swamp forest with little difficultly, but couldn't do the same with my longer boat a couple of weekends later. On the other hand, the short length means it doesn't track very well. The latter can be easily addressed if you know your paddle strokes. I use what I would call a J stroke with a slight C at the beginning every three or four strokes to keep on track. However, this sacrifices speed if you are into that, as some energy and momentum is used in the correction stroke. If I lean it a bit, it runs straight and true. The tracking was what cost it a point in the rating, but a longer canoe couldn't do some of the things I ask of the Pack. From what I have heard, and tried out myself briefly, it does really well with a double-bladed paddle. I don't use that due to the rotation being different on a bad shoulder (I can paddle a single blade all day on one side and avoid the high rotation in that shoulder) and really liking the art and tradition of using a single wooden paddle. The Pack has a reputation for being unstable, but I really have not found that to be the case for me. Primary stability (how much it rocks as you get in and out) is average. I have seen better and worse but never flipped this one. I don't stand up to fish but have stood a few times in the Pack and it is a bit unsteady. Secondary stability (how it behaves when tilted) is pretty good. I often run it at a tilt when I want some speed so I don't have to use correction strokes and have never flipped it or felt unsteady. The seat is a little high if you are of my size (6 ft and 185 lbs) so I bought some extenders and lowered it a couple of inches (see photo below). That definitely improved the stability while sitting and when kneeling it is very stable in my opinion. 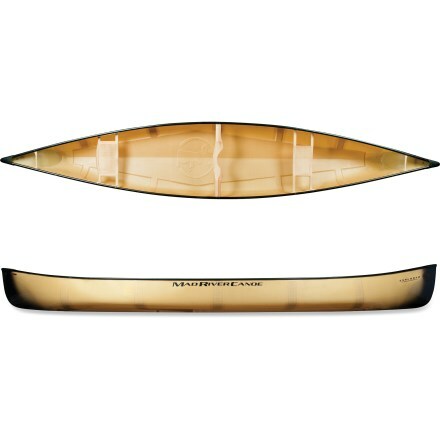 The hull is made out of Royalex, which is a discontinued composite plastic and vinyl. The hull scratches very easily (photo below) but has a lot of flexibility and I have never had any damage that affects the integrity of the boat. It has some "scars" but they don't bother me. The flexibility of the Royalex allows for the low weight of the boat, but also allows it to "oil can" on choppy water. I actually like the feel of this and it doesn't seem to affect its handling, but if that is a negative to some be aware. Construction is typically Old Town. The polyethylene deck and gunwales are solid and no issues have appeared over the half decade of use. The carry handles are comfortable when you need to use them, but that is rare as this is such a light vessel I just grab it by the gunwale and head out. 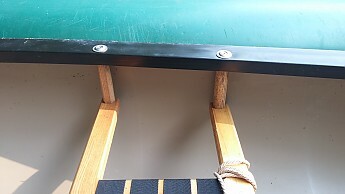 The ash seat frame and thwart are solid and secured to the canoe well. I lowered the seat (see above stability) easily and it still sits tight. The old cane seats were a little more comfortable than the web ones, but these seem to hold up better over time. This is where the Pack earns its name and reputation. The 33 lbs is a dream to get on and off a car, which is very important to me due to some lower back issues. I can carry it in one hand and usually rest it on my shoulder and have hauled it up to a half mile to get into hidden fishing lakes and other access points. If you want to go traditional and haul it overhead, there will be some adjustments needed as the thwart is not centrally located. I just don't find that necessary as it is so easy to throw on a shoulder and carry your paddle, and other gear in the other hand. 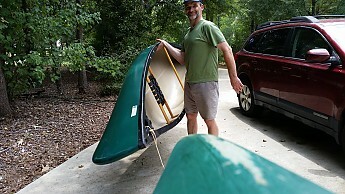 It's so easy to load and carry this canoe, that I find myself throwing it on the car on a whim for a couple of hours of paddling our local river much more frequently than I did with our heavier tandem canoe (Old Town Camper) and other prior vessels (4 or 5 over the years). The Pack is rated to handle 550-600 pounds. I think that is a little high. I use it for day long trips down the river and fishing, and have paddled it backwards with my wife. It handled well enough with two, plus a day's worth of gear and cooler etc, but you have to rig up seat cushions to make it comfortable and it rode a little low so I wouldn't necessarily try that in rougher water. I reviewed the Old Town Pack even though it is discontinued in case someone out there gets an opportunity to buy one used. I would not hesitate to buy this again, and if I see one will probably grab a second one just in case. Hopefully, the weights of the newer solo canoes will come down as new technology arises, but until then my back, along with the rest of me, just loves our little Pack. Great review, Phil! Thanks for taking the time to share it. 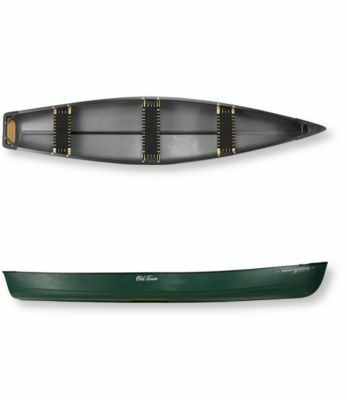 Both times we've bought canoes—also Old Town Royalex models—we got 1) a blemished one from the OT factory store and 2) a floor model at LL Bean. 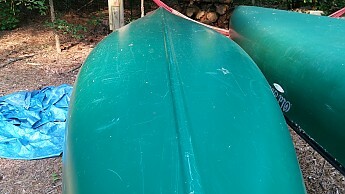 We figured any scratches, dents, and blemishes were no worse than what we might do to the canoes on our own. Thanks Alicia. I miss Royalex already and my Penobscot I sold way back. Scouring the internet for a used one but the couple that I have found are listed pretty high due to the Royalex plant closing down. Great review! Last year I searched every paddling site, craigslist, etc, every day for over 6 months, looking for a used Pack...never found one! Ended up with a barely used Wenonah Fusion RX 13, which weighs 42 lbs., so a bit heavier than the Pack ( which I wanted in part due to its light weight) But I love it, though I still kinda wish I had found a Pack...when I spoke with someone at Old Town, they suggested the "Next"...No way! Too heavy, ugly, and not enough room for me and my dog. I often use a kayak paddle, but always have my BB Special wooden canoe paddle with me....depends on my mood, the weather conditions, and how much load I have in the boat. Enjoy your OT Pack, you lucky duck! Ex boats...itchy trigger finger this morning. Very lightweight, stable, car-top boat perfect for solo paddling or fishing in calmer waters. Bought mine new ~1998, still using it for myself and two dogs. Two best features are 1) lightweight—I (5'5" woman) can handle it alone, and 2) car top—I can easily load and strap it (2 straps, 1 rope to front of car) on car factory roof rack (well within weight limits) and head to lake—no truck, trailer, or special after-market roof rack required. It fits inside my one-car garage ceiling, easily hoisted with rope pulleys, when not in use. It scratches easily, but this doesn't matter to me—still no holes. The original cane seat finally rotted through a few years ago, but I was able to replace it myself with spare webbing on the original seat frame. At the same time, I lowered the seat, as I'd always thought it was a little too high, causing the boat to be less stable/more prone to capsize during windy, choppy wave conditions. But, this does bring my knees closer to my nose. No, this isn't a speedy hydrodynamic touring kayak or racing canoe, nor is it made for whitewater or high wind/waves. I typically use a double-blade kayak paddle, as the boat is short with minimal keel so turns drastically with only one stroke, and the kayak paddle is a lot less paddle work. I did think some about replacing this with a touring kayak, but my dog(s) and camping gear won't fit in a kayak, and all the kayaks I looked at are considerably heavier! It IS a basic, very durable, all-around calmer-water fishing/shorter trip boat you can handle by yourself w/o having to beg someone to help you carry, load, or paddle it—just go canoeing when YOU want! Thanks for the review, JF. 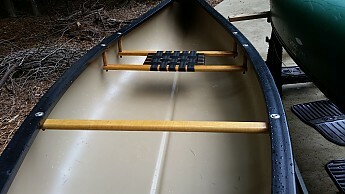 I have a HEAVY Old Town canoe that I bought used. They make good stuff. Thanks for the review, JFLawlor! I'd love to see some pictures of your Old Town Pack canoe if you're willing to share them in your review. 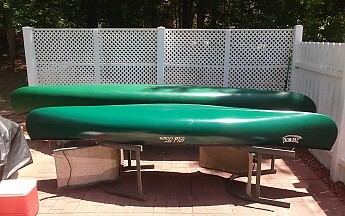 By the way, I have twice bought Old Town canoes that were blemished or floor models. It tends to be a good deal. I bought one of the last ones you could find, at REI. I am so glad I did. You can still get lightweight solos, but you will have to pay big bucks for kevlar. I like being able to bang around the Royalex. I have canoe camped with full camping and fishing gear and the pack handles it easily. I love being able to load and carry the canoe with ease without hurting myself. This is one sweet little canoe. I paddle it with a kayak double paddle. I don't know when someone will invent a replacement for Royalex, but I won't be giving up my OT Pack! 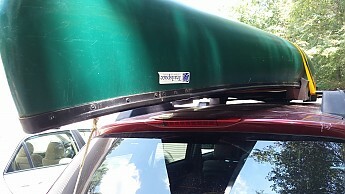 I have a few battle scars on my Wenonah Fusion RX13,too..remember, every dent and ding tells a story! Glad you were able to grab a Pack before they dissapeared. Since getting mine I have seen them on Craigslist for well over 1000...enjoy the paddling. I still prefer the wooden canoe paddle...tests my skill on this short craft, and the oil canning is something I quite enjoy now...feeling the water so to speak. 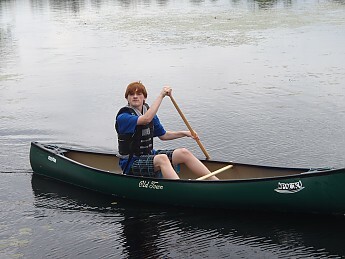 Thanks for the review of your canoe, Bradford! I'd love to see some pictures of yours in your review. I bought my Pack from a big sporting store that is undergoing changes. This was before that, about five years ago. I offered them $400. It had a disfigured gunnel, but I figured it wouldn't be a problem and it wasn't. It's Roylex and 33 lbs. I just throw it in the truck and go. Carries my 300 lbs well. My knee went out two years ago and when I had to carry it up the hill from the lake to my campsite I put it on my left shoulder and used a cane in the right hand and was able to do it. Couldn't have done that with my OT Guide or my previous Penobscot. A little small with my active Springer Spaniel, but not too tippy. Good for fishing unless the dog is with (he tries to retrieve the casts). Want a Kevlar solo, but will never sell this one. Welcome to Trailspace, Big Dave. I love canoeing in the Boundary Waters. Thanks for posting! Welcome to Trailspace, Big Dave! Thanks for the review. The Old Town Pack is not available from the stores we monitor. It was last seen October 24, 2014	at REI.